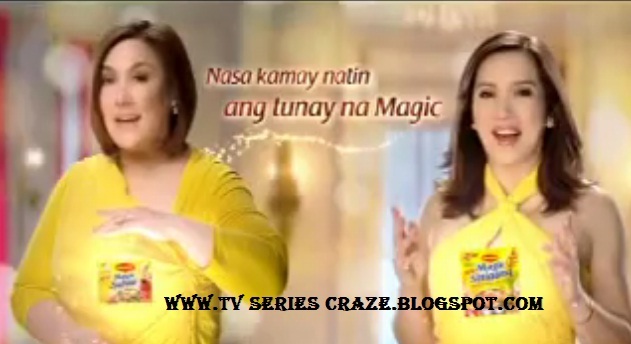 Sharon Cuneta and Kris Aquino Unite in The New Maggi Magic TVC! Two of the brightest and famous Kapamilya stars joined force in the latest and newest Maggi Magic TV commercial. They are the Megastar Ms. Sharon Cuneta and the Queen of All Media Ms. Kris Aquino. Shawie and Krissy were chosen to endorse the two newest products of Maggi. These are the Maggi Magic Sabaw and the Maggi Magic Sinigang. As the TVC states, a simple tinola becomes tinolamagical while a plain sinigang becomes an asimagical! Great! Both Sharon and Kris are the country's most-sought endorsers! They are today's Queen of Commercials and Endorsements! So nice to see these two biggest stars united in one magical TV commercial! Aside from this new TVC, we all hope other biggest names in the industry to join together in one endorsement like this! Nice!